The LANCOM Wall Mount is a robust bracket for attaching LANCOM devices with indoor housings to walls. A drilling template helps with the installation, and the padlock-equipped LANCOM Wall Mount provides effective anti-theft protection for your device. The “classic” and “white” color variants allow unobtrusive installation depending on the color of your device. The LANCOM Wall Mount (Rail) version is an easy and secure way to fasten your device to top-hat rails. The LANCOM Wall Mount ensures that LANCOM devices with indoor housings, including our access points or routers, are professionally and securely fastened to the wall. The LANCOM Wall Mount features a securing bar to fix the device and a padlock that prevents the mechanism from being opened. This allows you to mount your device even in easily accessible places because it is securely protected from theft. Supplied with the LANCOM Wall Mount are fastening materials, security bars, a padlock, and mounting instructions. Installation is quick and easy. The two color variants “classic” and “white” allow unobtrusive installation depending on the color of your device. The LANCOM Wall Mount (Rail) is a special variant that fixes LANCOM devices to top-hat rails and offers anti-theft protection. 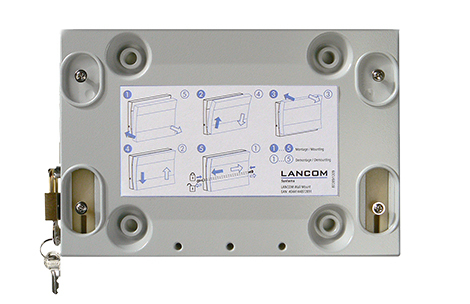 Here, too, you benefit from the professional and easy assembly of the LANCOM Wall Mount. LANCOM Wall Mount available in the color variants "classic" and "white"
LANCOM Wall Mount (Rail) is suitable for mounting on top-hat rails, available in the color "classic"